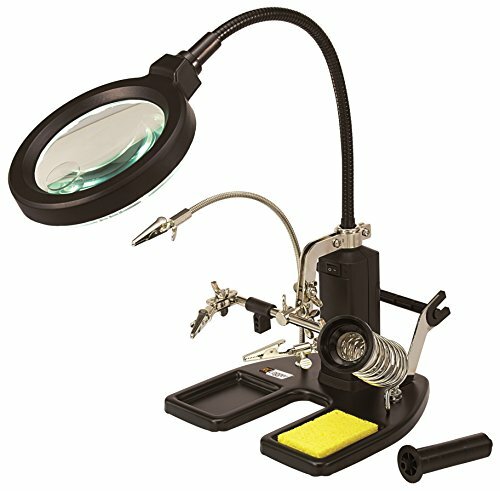 Designed with the user in mind, this LED Magnifying Lamp with Third Hand is the perfect companion for the workshop. Other than the third hand and a magnifying lamp, it also contains the spindle for brazing solder and the holder for the soldering iron makes this and indispensible tool. Handy assistant - Clamp (3rd hand): The LED Magnifying Lamp with Third Hand is literally a 'third hand' in aiding you with DIY repairs and is the perfect solution for the workshop. There are two sturdy metal clamps and a flexible 'gooseneck' clamp for you to secure circuit boards small parts like whilst you do the fixing up. See everything clearly: The LED Magnifying Lamp with Third Hand comes with a gooseneck magnifying glass with 16 integrated LEDS. This could give you a clear view of objects with its 2x and 4x magnification as well as 16 bright integrated LEDs to make sure you will have enough lighting to work with. BALANCED WITH A HEAVY BASE: This helping hand lets you fully focus on the work you are doing without having to worry that the tool will tilt over or move. FEATURES THAT HELP: No matter if you are assembling electronic components, micro soldering or doing other detail work,the holder for the soldering iron, the third hand, the magnifying lamp and spindle for brazing solder will help you with your task. GOOSENECK MAGNIFYING GLASS: Ease your sight with the 16 integrated LEDS and view objects with its 2x and 4x magnification. FOR WORK AND HOBBY: This helping hand is ideal for micro soldering, assembling parts, building rc quadcopters and miniatures and any other kinds of tasks. Manufacturer: CEI Conrad Electronic International (HK) Ltd. Publisher: CEI Conrad Electronic International (HK) Ltd. Studio: CEI Conrad Electronic International (HK) Ltd. If you have any questions about this product by RC LOGGER, contact us by completing and submitting the form below. If you are looking for a specif part number, please include it with your message.